Dr. Patel is a part of Georgia Behavioral Health Professionals. Patients see him for a variety of reasons, including psychiatry consultations, bipolar disorders, autism, obsessive compulsive disorders, and anxiety. He is sensitive to the uniqueness of each patient's situation and adapts his consultations and treatment options appropriately to accommodate individual needs and concerns. Dr. Patel is uncompromising in his dedication to the well-being of his patients. He is committed to giving the best care and establishing long-lasting relationships with them. Dr. Patel earned his medical degree from the Indira Gandhi Government Medical College, Nagpur in India. He completed his internship at the same institution. He then moved to the United States to complete his residency in psychiatry at Metropolitan Hospital Center, New York Medical College. Dr. Patel completed his residency in child, adolescent, and adult psychiatry at Brookdale Hospital in Brooklyn, NY. 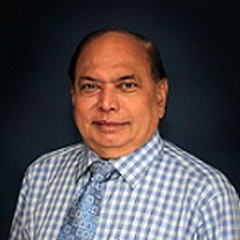 Dr. Patel worked in Internal Medicine as a surgeon from 1976-1979 in India. He is currently serving as Director of the Department of Psychiatry Medical Center in Columbus, GA.
Dr. Patel received rank for the highest level provider to be on the Advisory Board of Shire, Pfizer.